Kettering Town assistant manager Dean Greygoose says pre-season training has shown that Jordan Patrick has the quality to impress this season. Patrick, 21, joined the Evo-Stik Southern Premier side on a one-year deal after his release from Cambridge United in May. 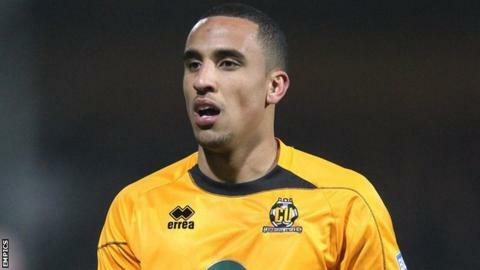 Greygoose told BBC Northampton: "I've seen Jordan play as a 17-year-old and I know what ability he's got. "He has to get his fitness levels back but we know he's got the quality." Patrick made 21 appearances for Blue Square Bet Premier side Cambridge last season, mainly as a substitute, and scored two goals. "He's had his ups and downs with things but he is a very exciting player - he can make things happen and he's got something different," added Greygoose, who arrived at Nene Park with new manager John Beck in June. Under Beck, the Poppies have also signed Ed Palmer, Oscar Radford and Jamie Griffiths. Defender Palmer, 20, arrives on a one-year deal. He came through the Torquay United youth system and spent time on loan at Truro City last season. Radford, also a defender, began his career at Sheffield United before moving to the Blades' Hungarian feeder club, Ferencvaros, at 16. Midfielder Griffiths, 20, was a free agent prior to signing a two-year deal at Nene Park, having previously played for Plymouth, Ipswich and AFC Sudbury. "Jamie came to the trial game and we liked what we saw. He's very athletic and although he's still got a lot to learn, he has done very well so far," said Greygoose. "We have got three or four more signings in the pipeline. We've got a lot of hard work to do to get the right players in." Goalkeeper Laurie Walker, defender Phil Ifil and midfielder David Bridges remain from last season's squad, although Ben Ford has joined Nuneaton.